No feed-in tariff? No problem. Solar energy is still a great investment. Since its introduction in 2010, the Feed-In Tariff (FiT) has been a great incentive for consumers wishing to adopt Solar energy. However with the tariff ending in April 2019, now is the time to move on and look at alternative ways of installing, using and conserving solar power. The first thing to remember is that solar is still a good idea. The idea that the Government is required to help us to buy and install solar power is a learned behavior and it’s time to re-condition our thinking. Solar Power can easily be installed, and used, by anyone*, without the requirement for the Feed-In Tariff, or a qualified installer. 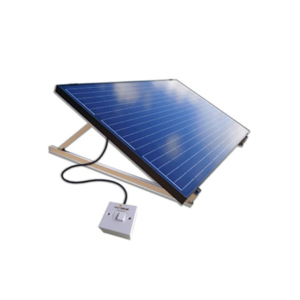 With a Plug-In Solar DIY kit, you can install your own solar panels safely, and use the free energy you produce to power the appliances in your home. You do not need any prior qualifications, or experience to do this*. As an example, a 2kW Plug-In Solar kit can save you an average of over £786 per year in electricity costs, over its 20-year lifetime. That’s a total saving of over £15,724**. The way we use energy that we generate from solar power is nearly as important as the amount we generate. Through the use of efficient appliances such as LED Light bulbs, timer switches, energy monitors, and clever gadgets, such as immersion switches (excess energy can be used to heat water) we can use the energy we generate from solar power much more intelligently. Please ask us about how we can help with these options. Energy storage, such as batteries, allow you to save your solar energy for when you need it most. Batteries work by diverting excess solar energy, which would otherwise be exported back to the grid, and storing it for use at a later time. When power demand in the home is greater than solar power generation, the battery can release the stored power back into the home, resulting in a reduction of energy import (buying power from the grid). By using your own solar and battery power sources, you can keep your home’s energy demand at zero, resulting in lower average energy costs. There is a wide range of energy storage solutions currently on the market, and such solutions are only going to get cheaper, easier to install, and more user-friendly as time rolls by. Not only will they help us store the energy we generate from solar power, but also use it more wisely. risk. All work must comply with the latest edition of the IET electrical installation wiring regulations, and if you are unsure please consult a professional. ** The performance of solar PV systems is impossible to predict with certainty due to the variability in the amount of solar radiation (sunlight) from location to location & from year to year. This estimate is based upon the Government’s standard assessment procedure for energy rating of buildings (SAP) and is given as guidance only. Illustrative solar PV performance figures only. Figures are given in good faith but do not constitute “Financial Advice”. Yearly PV output uses a factored degradation over time based on industry estimates. Photovoltaic Panels will not be shaded (e.g. by Trees or Buildings) as shading affects PV output. Specific appliance ratings and equipment age will affect energy consumption and these examples are guidelines only. Appliance consumption information from Center for Sustainable Energy www.cse.org.uk). Based on A-Rated (or higher) appliances. These figures assume that you have south facing 250W polycrystalline solar panels, tilted at an angle of 35°, you pay 14.37p per unit of electricity (Standard rate as of May 2017 source: Energy Saving Trust) and 100% of the solar electricity that you generate will be used in your home. Calculations assume an annual energy price inflation of 10% & include solar radiation & system losses, in a western UK location, due to Temperature 6.8% and Angular Reflectance 2.9%, as well as other losses (e.g. Cables, Inverter) of 12%. Is digital construction helping foster better working relationships amongst the industry? We’re raising the bar in the industry with an ambitious strategy to continue our significant growth.